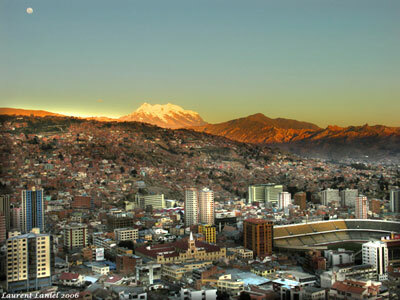 If you are travelling to Bolivia you will most likely visit the city of La Paz for a day or two. Bolivia’s main international airport can be found here and La Paz is well located to make it a base from which to explore Bolivia’s main tourist attractions such as Lake Titicaca, Tiahuanaco, Sorata, Oruro, Coroico and the northern lowlands. La Paz was founded by the Spanish on 20 October 1548 under the name of La Ciudad de Nuestra Señora de La Paz (The City of Our Lady of Peace). With a population of nearly 1.3 million inhabitants, La Paz is now a modern city with few colonial buildings left except around Plaza Murillo, which at 3636m above sea level, marks the very heart of the city where the government buildings and the cathedral can be found. The sprawling town ofEl Alto (4082m) is the city’s poor relation and sits on the rim of the altiplano exposed to the icy winds. This rapidly expanding district comprises almost entirely immigrants from the countryside. The average daily temperature in winter is 10°C (59F) and 22°C in summer. The nights throughout the year are cold. From December to February rain falls most afternoons but the sun usually shines for several hours. The rest of the year is mostly clear and sunny. La Paz is 1 big market ,one of the famous ones is the witches market . The Tiwanaku-Culture resided in the years 1.600 a.Chr. to 1.200 p.Chr. At the Altiplano. They are the predecessors of the Inca-Culture, passing to them their astronomical, mathematical, and religious knowledge, and the way how to treat metals and agriculture. Only 71 km away from La Paz and reachable by paved road, you can learn about Tiwanaku, the famous archaeological site,the museum is new from 2004 ,and very nice ! The most dangerous road, exiting mountain bike tours /1 day tour .A fantastic adventure that begins in La Paz and end at Coroico town. Across the most dangerous road in the world (3600m of altitude difference). Travel with professionals to this adventure. PROGRAM (Altitude 3600m) we leave La Paz at hrs 8:00 AM, with our own transport and arrive in la Cumbre after a trip of 90 minutes. La Cumbre is at 4500m of altitude. From this place we begin the descent till Coroico, over a twist road, with many curves. In travelling 64 Km. we will be able to observe the climatologic and geographic changes, from mountains covered with snow and fog to the pleasant humid of tropical forest. In the itinerary we receive a lunchbox. You have the attendance of our guide and mechanic. During the passage we will be able to make the stops necessary to take pictures When we arrive at the town of Coroico we can relax . On the way, we shall see typical animals like llamas and other characteristic of the region. After arriving at Coroico our private transport shall bring us back to la Paz where we arrive in the evening. *Required total time 12 hrs. *Climate at the beginning cold, the rest of the trip, hot. A different world between the animals, back to nature, swim with the dolphins!!!!! Tours in pampas with many animals or selva with many medical plants. Chacaltaya ,highest ski run in the world, you can walk to the summit of chacaltaya, more than 5000 mt altitude for amazing views of Titicaca and la Paz ,huayna Potosi , we can arrange a daytrip from la Paz with visit to the Valle de la Luna /moon valley with beautiful nature. Chacaltaya 6 hours tour ), know the highest sky run in the world, where you will be able to feel the sky that ever closer than ever before .You will enjoy the Andean sun, enjoy and feel the snow who is there for ever, see the imposing Andean Real range: You will see how the river is born, admire the highland fauna with their beautiful species. You look at La Paz city from this natural observatory. It include the transport close to the top, the last part you have to walk and for sure you gone feel the altitude!! !